George Clooney and Amal Alamuddin are getting married next month. According to reports, Anna Wintour will be amongst the few guests at the nuptials, aaaand the wedding will be covered in Vogue. Amal and George are probably breathlessly anticipating what ridiculously-long Marriage Hashtag the fashion bible will assign them in lieu of a gift (#WorldsSecondMostTalkedAboutCouple is my guess). 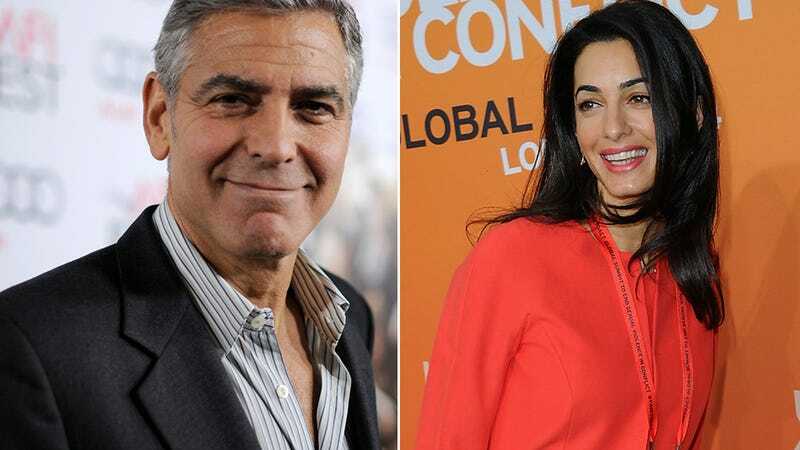 The wedding will be very small, and it will take place in Italy; according to sources, Amal will wear Oscar de la Renta and George will wear Armani. Earlier this week, the couple had their wedding banns posted in London, which is a fancy thing British people do, I guess, announcing their intention to wed.